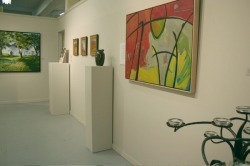 Heron Studios is a vibrant community of artists that hosts art shows several times each year. 20th annual open house & holiday sale!! The celebration will continue on Saturday, 11/18, with live music and food trucks! Don't miss out on the festivities! Situated along the Chester Creek, the studios are located in a circa-1800 historic cotton mill. Exposed beams, 12-foot ceilings, and tall windows make this a inspiring space to work in. Each November, Heron Studios holds its Annual Open House and Holiday Sale. Works by our resident artists are shown alongside creations from select guest artists.